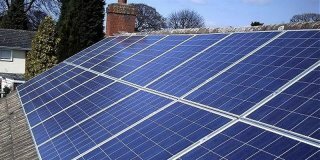 This page contains information on wind and solar power generators in relation to Building Regulations requirements, with external links to grant funding and further information on renewable energy sources. 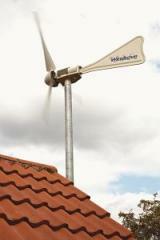 The installation of wind turbines, photovoltaic panels or any device generating electricity which connects with a domestic electrical installation, is required to comply with the provisions of Part P (electrical safety in dwellings) of the Building Regulations, to ensure the electrical safety of the installation. Furthermore the installation of any type of device, which would materially affect the loading of a building, is covered by requirements under Part A (structure) of the Building Regulations. This is to establish that the buildings structural integrity is not compromised by the new installation. Work that is carried out by an organisation registered on a competent persons scheme appropriate to the type of installation recognised by the Secretary of State for the Department of Local Government and Communities, confirms compliance with the Building Regulations. Notification of this is provided to the Local Authority by the operators of the scheme. In all other cases the appropriate Building Notice or Full Plans Submission is to be made under the Building Regulations. Energy Saving Trust [external link]. Department of Energy and Climate Change [external link]. Do I need Building Regulations approval to carry out electrical work in my house? These schemes are designed primarily for those who do electrical installation work as an adjunct to or in connection with their primary work activities - for example, in connection with gas installations kitchen or bathroom fitting, or fire alarm or security system installations. OFTEC (Oil Firing Technical Association Limited). Do I need Building Regulations approval to insert cavity wall insulation? Yes, but if you use an installer registered on the Competent Person Scheme below, all procedural matters will be dealt with as standard. Do I need Building Regulations approval to install replacement windows, doors or roof lights in my house? However, where an opening is to be enlarged an application for Building Regulations approval will be required irrespective of the fitters registration on one of the a fore mentioned schemes. Do I need Building Regulations approval to replace the roof covering of my property? Do I need Building Regulations approval to install a micro generation system? 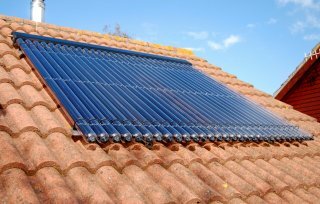 Please note that it is possible for the installer to be registered on one of the above competent person schemes but not be registered for works to micro generation and renewable technologies, it is therefore important that you ensure that their scheme registration is appropriate to the work that is to be undertaken.